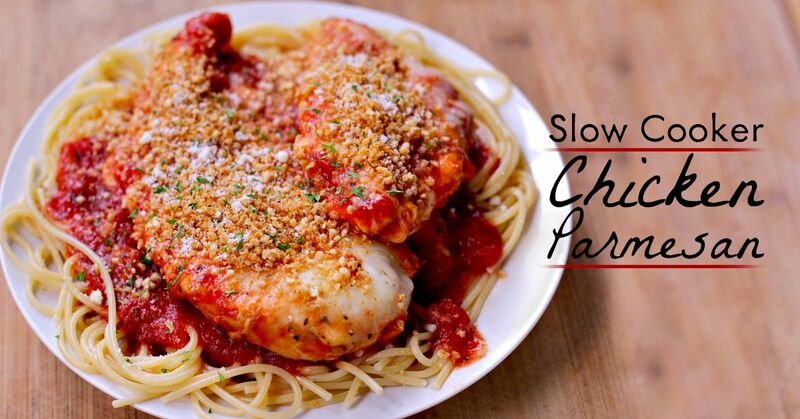 Dump Recipes: The Best Crockpot Chicken Parmesan Recipe! 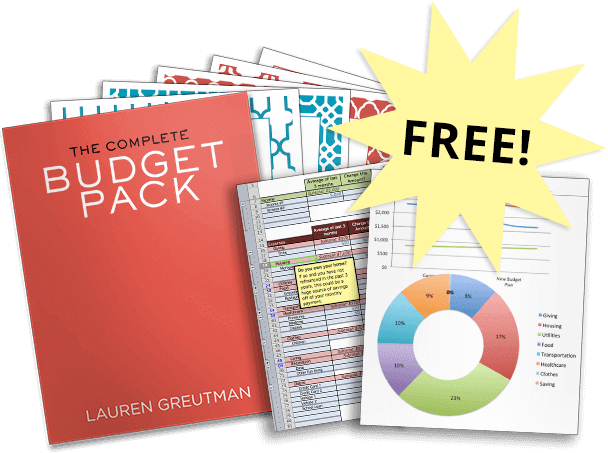 sent right to your inbox! I love Chicken Parmesan, but I also love the convenience of dump recipes. 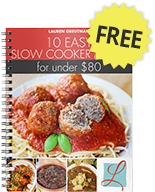 That is why I got thinking about creating my very own Crockpot Chicken Parmesan, BRILLIANT I thought to myself….So here it is, it tastes like the real thing with the convenience of a dump recipe! I was skeptical to try and make this, but this crockpot chicken parmesan isn't just good, it's AWESOME. And I love chicken parmesan. In fact, I have what I believe to be the ultimate chicken parmesan recipe. But this is just easier because it is a dump recipe that you has fewer steps and a ‘set it and forget it' approach. There was some concern though… how was I going to get the tanginess of the sauce, the tenderness of the chicken, the salty gooiness of the cheese, AND the salty crispy crust from a crockpot? I was mostly concerned about the crispy crust. Crockpots don't do “crispy” very well. So the solution is to quickly make a crispy breadcrumb topping to go over the cheese and the chicken! All the textures and flavors you need from a great chicken parm are here – just in a different order. And once you take a bite, you will understand. And you will make it again and again. Because it's that good. 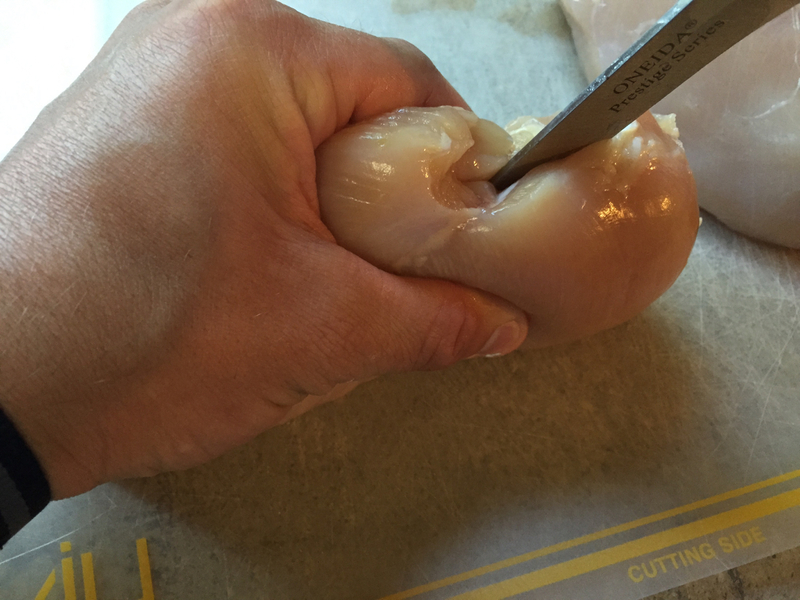 To start with, you need to get the chicken to the right thickness. You could pound it, but I've found that slicing in half lengthwise with a sharp knife is less messy and faster. Then maybe give a little pounding with a tenderizer to get the thickness consistent. I only use 1 1/2 chicken breasts for this and it's plenty. I take the largest half and then cut in half again to get a total of 4 pieces. 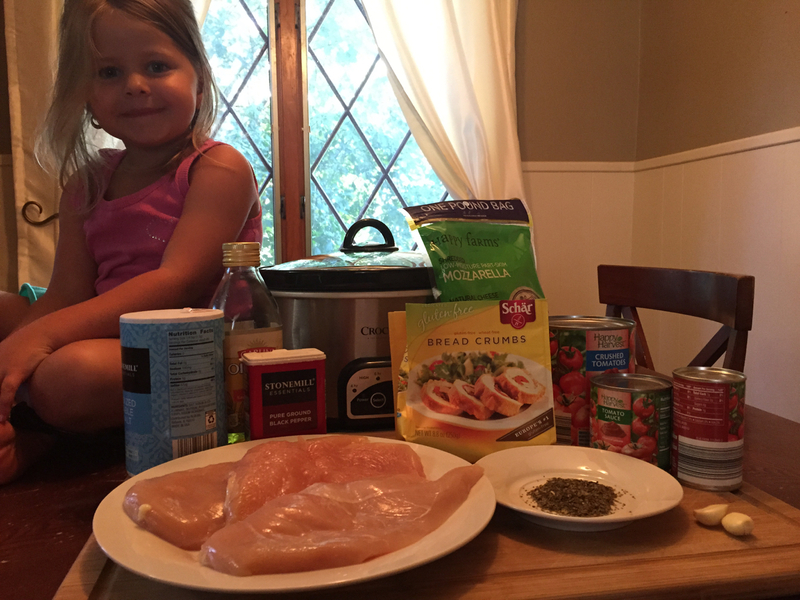 Here are the ingredients (including my “helper”). 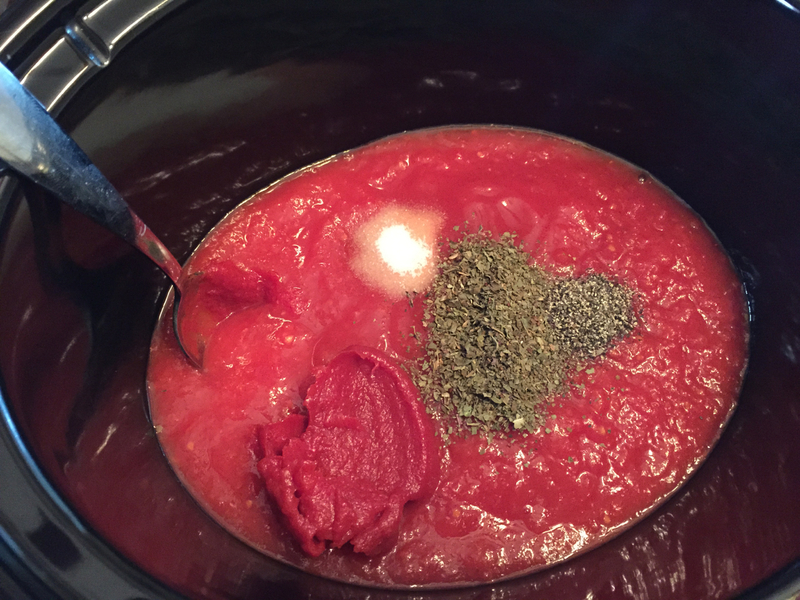 Start by combining all of the sauce ingredients in the crockpot (crushed tomatoes, tomato paste, tomato sauce, salt, pepper, basil, garlic) and mix them well. Place the chicken on top and sprinkle with a little salt and pepper. Cook for 4 hours on high. After it's almost done, you might need to pull the chicken out for a minute and stir the sauce again. Then place the chicken back on top, followed with the mozzarella cheese. Close the top and let the cheese melt – this will take about 10 minutes. While the cheese is melting, get started with the breadcrumb topping. In a small pan, heat the oil over medium heat for a minute. Add the breadcrumbs with a pinch of salt and pepper. Cook, stirring often for about 5 minutes. To serve, scoop out a piece of chicken with some sauce underneath and place over pasta. Top with a big scoop of the crispy breadcrumbs. Enjoy! 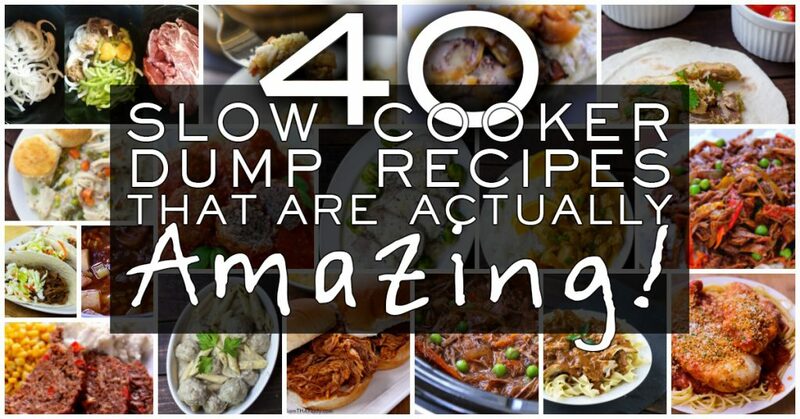 And if you like this one, you might be interested in my 40 other slow cooker dump recipes! They are seriously amazing! Chicken Parmesan in the crockpot? Yes. And it's actually good. And by good I mean AMAZING! 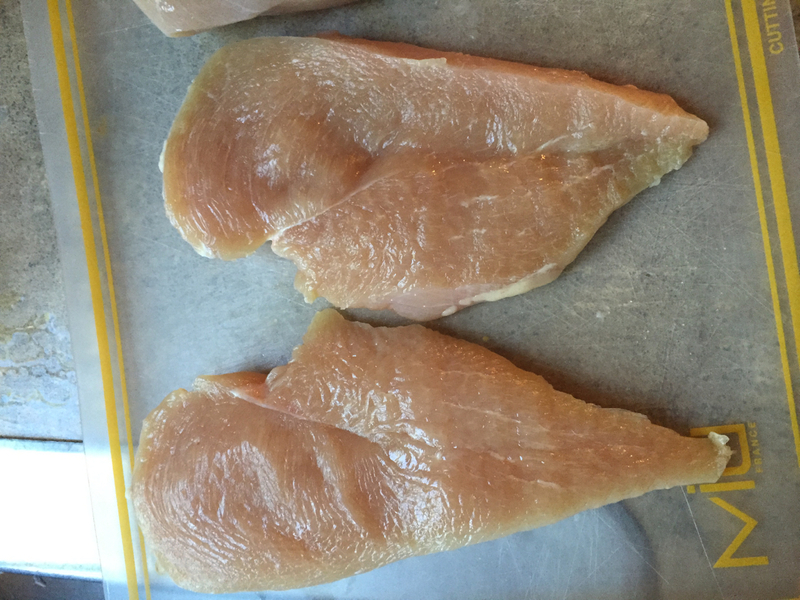 Slice chicken breasts in half lengthwise. Combine crushed tomatoes, tomato sauce, tomato paste, slat, pepper, basil, and garlic in the bottom of the slow cooker and mix well. Add chicken breasts on top of the sauce and sprinkle with salt a pepper. Cook on high for 4 hours. 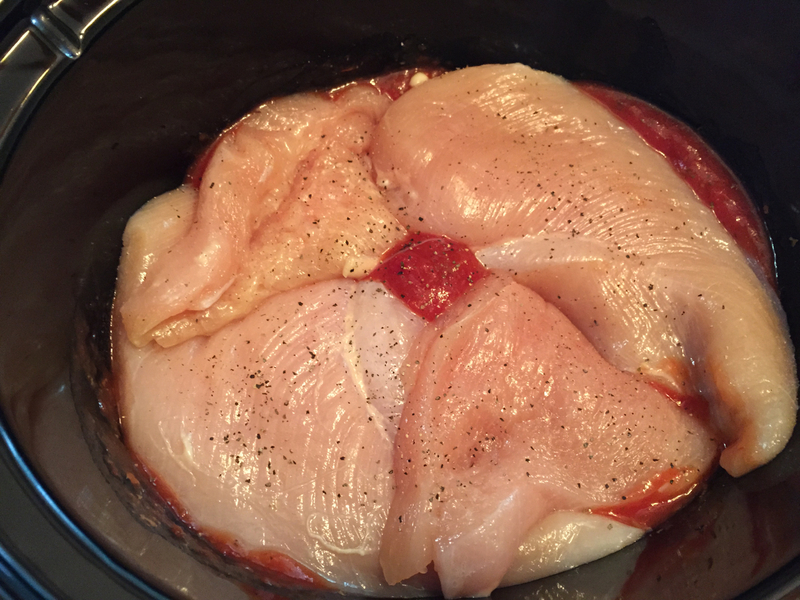 Remove chicken from slow cooker and stir sauce. Place the chicken back on top of the sauce and top with the cheese. In a small pan, heat the oil over medium heat for a minute. Add the breadcrumbs with a pinch of salt and pepper. Cook the breadcrumbs, stirring often for about 5 minutes. To serve, scoop out a piece of chicken with some sauce underneath and place over pasta. Top with a big scoop of the crispy breadcrumbs. How long would u suggest cooking it on low? Is the tomato sauce, just usual tomato sauce? As in the sauce you use to dip chips in? Tomato sauce comes in a can and is located in the grocery by the canned tomatoes. [As in the sauce you use to dip chips in] I think you are referring to salsa…that is not the same as tomato sauce. Tried this for the first time, not to bad but something seemed to be missing…. its the parmesan, there isnt any parmesan in the recipe. How can it be chicken parm without the parm? I agree there is something missing. Cooking this for 4 hours is too long. The chicken is cooked through in 2 hours. I use Italian seasoning instead and it was still bland. I am going to try using more seasoning and 1 more garlic clove. Maybe even using fresh? Fanstastic easy, my husband & I love it, will be a one of our favorites, will make again & again. This could have been a good recipe except for two things. 4 hours is wayyy too long. By the time 4 hours is up the chicken is dry and there’s no sauce. Trust me… I know. I just made it. So disappointed. Flavour is nice but not enough because of above. Also mozzarella has no flavour. Where’s the parmesan? We followed the recipe to T but I wish I’d taken it out 2 hours earlier and added parmesan and a bit of cheddar with the mozzarella. For anybody trying this do not leave for 4 hours on high! Good to know! Thanks so much! That is what I love about dump recipes, they really do work just by dumping the ingredients in. I was thinking the same thing! Was it good with parmesan? The recipe left out the Parmesan cheese?? Where does it come in?? FABULOUS!!!!!! I served this to a lady who is quite a food snob. She loved it and said I could fix this for her anytime. I used Italian bread crumbs. No one (all 5 people), even mentioned the missing parmesan cheese. Awesome!! So happy you loved it! – After 4 hours in the crock, I removed the chicken breasts, lightly breaded in seasoned bread crumbs and lightly fried in olive oil. It was absolutely divine!!! I never would have thought to use the crock pot for chicken Parmesan, but I don’t think I will make it any other way from here forward! Absolutely, Susan! This recipe is also in one of our Meal Plans, so when I make this recipe, I typically make it with a bunch of other meals and then freeze it. Making it the night before and refrigerating it would be perfectly fine. This sounds amazing, I’m going to make it right now!!!! My neighbors and I are having a little potluck dinner I think this would be great. I used whole breasts, flattened a little. I used Italian style diced tomatoes for more zip and cooked on LOW 4 hrs. Longer or hotter would have made the chicken dry. Also sprinkled parmesan cheese on top of chicken & pasta. Definitely a redo. I didn’t make bread crumbs or miss the crunch. I’m going to make this for dinner tonight. Im staying in Tennessee on business from California and living in a hotel while I’m here. My neighbor fed me spaghetti Sunday night so I wanted to return the favor wout taking them out to eat. I’m going to use whole chicken breasts though. Should I cook it for four hours still? Wish me luck y’all ;). I’m not much of a cook and I used 2 different types of jar spaghetti sauce, one being a vodka cheese sauce, because it’s what I had. I also added a can of stewed, chopped tomatoes with green chilis. This was the best chicken meal I have ever made! I used the linguine noodles, which are my favorite. I can hardly wait to make it for company. It was so easy. 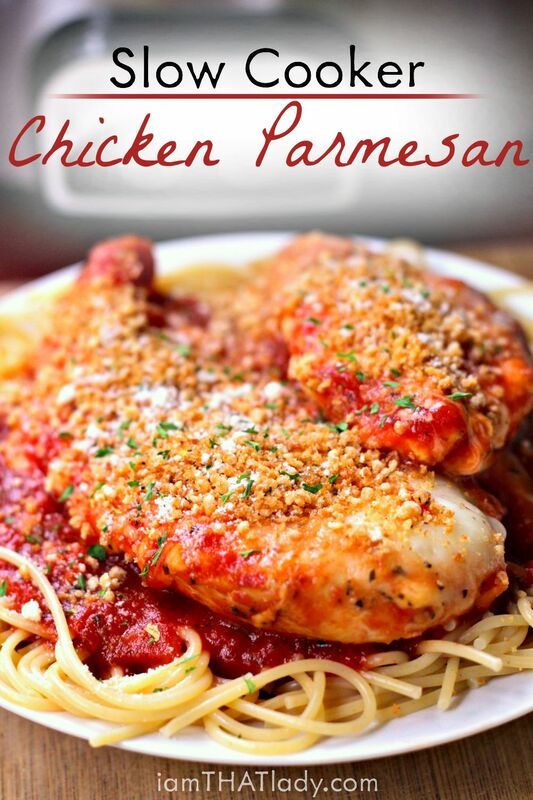 This extremely easy recipe was a hit with my picky husband who says he loves parmesan chicken but I know he doesn’t like parmesan cheese so this recipe was perfect. Nothing was missing. A hit with all! Thank you this recipe will definitely be in our rotation from now on. We had it about four nights ago. It’s not too soon to make it again is it? Just made this for the second time monday night, absolutely loved it, once again!! even my 5yro who dislikes red sauce loves this dish!!!! will def remake over & over again!!!! ty!!!! I’m adding quite a few steps that were mentioned by the other ladies. I will also egg and breadcrumbs to the chicken after cooked in the crock, fry until stuck to the chicken, then put in a casserole dish and bake with the mozzarella. I will add the parmesan into the sauce in the crock. Sounds so great!